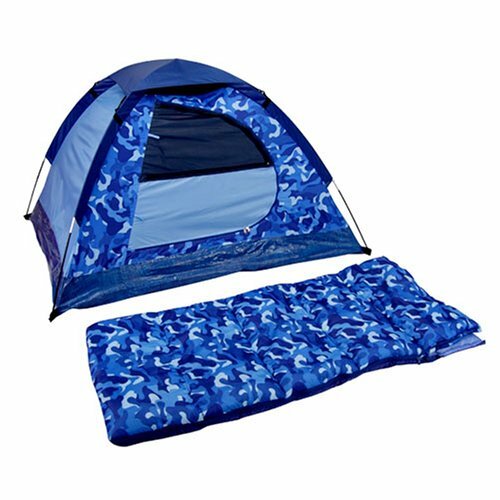 The Exxel Explorer 7-piece blue camouflage camp set is a great choice for backyard camping or car camping with the family. The set includes a dome tent, sleeping bag, flashlight, water bottle, compass, and dog tags. The tent has a floor area of 5 feet by 4 feet and is 36 inches tall at its highest point. It has a mesh roof for good ventilation, a rain fly, and durable ripstop polyethylene floor. The sleeping bag measures 28 by 57 inches and has 2 pounds of Triloft II polyester fiber insulation and an all-around zipper. It's machine washable for easy care. The backpack features adjustable carry straps and multiple pockets, and comes with a compass and water bottle. Love this so much I got two!! Be careful of broken poles!! I purchased this for my 5 year old for Christmas. He loves it and has slept in it the last several nights. However, one of the poles did break. It didn't snap in two but splintered. Just lightly touching the splintered area embedded small invisible fiberglass slivers into mine and my wifes fingers. Quite painful. Yep, I was dumb enough to touch the same area that had just caused her an "owie". Today I emailed Exxel Outdoors for info on replacement poles. Until then, duct tape is working. We really have enjoyed this product, the tent is easy to set up and has shock corded poles so you wont lose them. We set it up in 5 minutes it is freestanding so it can be set up in the house. The kids play in it all the time. They put the sleeping bag inside and have pretend camping trips. The great news is when they are done it goes back in the zipper camo bag for easy storage. Great for sleepovers since the bag is a nice indoor size and weight. This would make a good gift for a boy or girl and the kids can use it without it taking a long time to set up.